Yeast-raised sweet bread plump and round with sweet spices, lemon and a little dried fruit and candied peel. Made in a large size with (typically) 8 division markings and a small, individual, form known as a starver. Alas, Colston is now in disrepute in this crazy time of asinine politically correctness…for being a successful slave trader. People forget that in his day slave trading was perfectly respectable like buying and selling motor cars today! 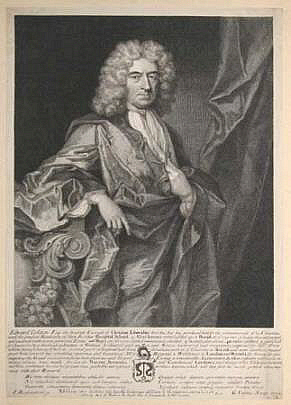 However, Colston was also a philanthropist who helped a lot of people, and gave great sums of money to the city of Bristol. How about Jardine Matheson of Hong Kong selling Opium to China in the days of “gunboat diplomacy” then??? Do you want to close down Jardine Matheson??? Truth be told, Edward Colston is like a “cult figure” in Bristol. 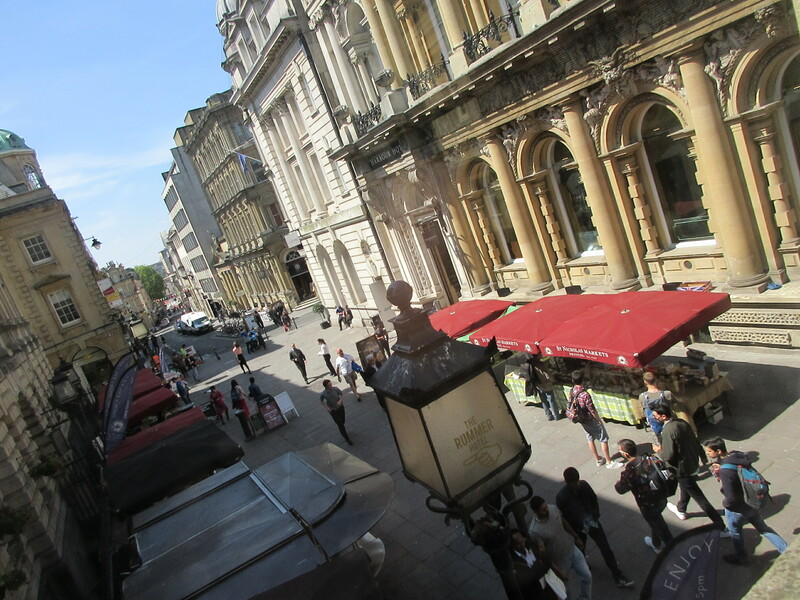 There is Colston Street and Colston Tower is on Colston Avenue. There is the Colston bun, which you are meant to eat on Colston’s Day. There is Colston’s Girls’ school where statues abound everywhere and three ceremonies are held every year to celebrate his life.” There will be one less Bristol institution bearing his name in 3 years time. The concert venue Colston Hall will reopen in 2020, after its refurbishment, with a new name. The asinine politically correct Libtards fail to take into account that Colston Hall was built almost 150 years after Colton’s death, and was actually named after its address, which is Colston Street. I for one, to be brutally frank am not into political correctness aka hypocrisy. To me it is a load of Balderdash! I digress…so.. In Bath, you have the Bath Bun. In Cambridge you have the Chelsea Bun in my favourite Tea Shoppe…Fitzbillies! 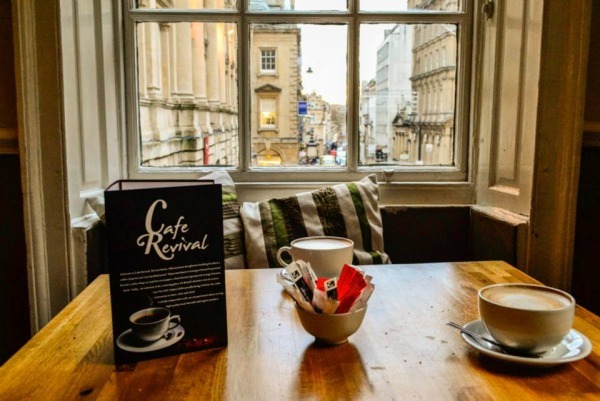 I wanted to taste the Colston Bun of Bristol and so I began my quest by going to the OLDEST Coffee House in Bristol. I had been advised by people from Bristol Tourism that it was not a salubrious place and best avoided. A good friend, Gwynneth, and Sian, her daughter, told me, “It’s full of hippies!”. Your training is always a part of you. Where are the Riff Raff?? All the customers were very normal, respectable people drinking tea and Flat Whites and Cappuccinos and eating cake. Not one single drug crazed Hippie smoking “Pot” in sight! It was an anticlimax. I was prepared to Keep Calm and Use Krav Maga but now I saw that everything was cooool…Café Revival serves local, fairtrade and organic produce and sandwiches…and there is FREE Wi-Fi! No wonder I observed quite a few business executives inside working on their laptops. I decided to have a frothy Cappuccino to revive myself. After all…I was in Café Revival! Right, mate, it was time for Plan B. Accordingly, I went to explore St. Nicholas Market which was very near the oldest Coffee House in Bristol…The market is a fascinating place with many shops and stalls and lots of my favourite things in life…FOOD, glorious FOOD! Like Mike Hammer, PI, I went to ALL the pastry shops, cake shops and bakeries in the vicinity asking politely, “Have you got the Colston Bun?” The answer was invariably, “Colston Bun? Never heard of it?? ?” So, loyal readers and friends and food lovers…there you have it. 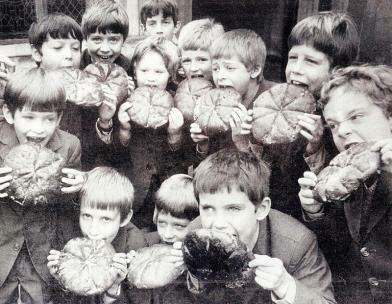 You cannot get the Colston Bun in Bristol where it originated! The only way to get the Colston Bun is to make it yourself!!! Fear not. Here is the Recipe…Food lovers, this is for you! Put the raisins, cranberries, diced apricot Paysanne, diced mango, diced papaya and diced pineapple in a mixing bowl. Combine Orange juice and Orange zest and Grand Marnier. Mix well. Add honey and stir well to combine all ingredients. Melt the butter under low heat and add in the milk. Let it cool.Now mix the sugar, yeast, flour, salt and spices in a big mixing bowl. Drain the orange juice from the fruit mixture. Keep the juice to add to the dough. Add the fruit mix to the flour mix and combine well. Add the saved Orange juice and Grand Marnier to the flour mix. Then add the milk and butter emulsion and egg to the flour mix. Mix well by hand or by machine to make a dough! On a floured worktop press and knead till the dough achieves a bouncy consistency. Now put the dough in a bowl and cover with cling film. Let the yeast work so the dough will become bigger in size! Takes about 2 hours. Punch, Tettsui and Karate chop the dough for awhile! Now shape into a round cake shape. Gently and lightly cut about 2mm into the top of the dough with a ceramic knife. Four cuts is enough. Brush egg wash over the top and leave for 30 minutes. BAKE in a pre-heated conventional oven at 170C until golden brown. Takes 20 to 30 minutes. Cool and enjoy with Ronnefeldt Earl Grey Tea! 🙂 You can also spread Oxford Marmalade on it before eating! OMG! Yummie! Bon appetit from The Travelling Gourmet TM ! I have baked my own Colston Bun and it was absolutely fabulous!!! Below is a photo of my Colston BUn soon! Yummie! Yummie! I let my affable pal, Simon Hirst the General Manager of the iconic Raffles Hotel try my Colston Bun…and he told me, and I quote, “…excellent Colston Bun!” It made my day! – Yes – the Cathedral is an Anglican Cathedral and its Dean is the Very Revd Dr David Hoyle. – The buns are provided by the Merchant Venturers who commemorate the day they received their Charter from the Crown every November. See http://merchantventurers.com/society-of-merchant-venturers-celebrates-charter-day/ for further information. They are provided for school children and are not available to the public. It is important to note there is no ‘Colston Day’ in that sense, and his life is not celebrated as part of the Merchant Venturer service. I have emailed the Head of the Merchant Venturers, one Callum McAlpine to make further enquiries (just like a Scotland Yard Chief Inspector) but to date NO reply has been forthcoming…even after 3 enquiries to date (Friday 30 June 2017) NO REPLY! Tja, Tja, Tsk, Tsk…not very nice…discourteous to say the least. from the MAYOR of Bristol, the Right Honourable Marvin Rees. Thank you for your email – I am pleased to hear that you enjoyed your visit. I don’t think it is simple political correctness which has led to Bristol Music Trust deciding to change the name of the Colston Hall. Bristol, as you may know, has a complex and controversial history with the slave trade. As a Bristolian of mixed race heritage I never felt comfortable celebrating a slaver and support the name change. The Society of Merchant Venturers is an entirely distinct organisation and therefore I cannot accept your complaint – although I am very disappointed to hear they did not acknowledge you. Thank you for the background and recipe for the Colston bun. My friend and house guest Pierre has made the buns to send home with our guests who are coming to a 12th Night dinner tomorrow. He and I were in Bristol in the fall of 2017. My attention was drawn to all the instances of the name everywhere, the favorite was Colston Public Toilets. We saw the Girls School, Tower, and Music Hall while we were there. My family name is Coulston, and I have found many variations of the spelling in various places and records. I have no idea if there is a connection to Edward or not. Thanks again for the information. We’re putting it to good use. This entry was posted in Chocolates & Desserts, Fabulous Food, Food and drink, Friends & Comrades, History, Let them eat Cake..., News and politics, Nobody's perfect..., Philosophy, Poems, Snacks & Little Bites, Travel, Voyages and tagged "Starver", Bristol, Bristol CathedrAL, Cafe Revival, Colston Bun, Dr. Michael Lim The Travelling Gourmet, Edward Colston, Edward Colston Tory MP, Gastronomic safari, Hot Air Ballooning, Oldest Coffee House in Bristol, Raffles Hotel Singapore, Simon Hirst, The Scarlet Pimpernel, Wendy Matthews. Bookmark the permalink. 2 Responses to The search for the Colston Bun!